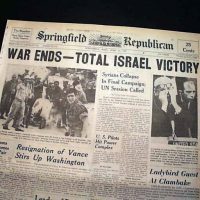 This post would have been more timely if written last year in response to Stephen Shalom’s article, “Looking Back at the June 1967 Middle East War,” in the summer 2017 issue of New Politics; but it’s still appropriate a year later for the 51st anniversary of the Six Day War (June 5-10, 1967). It reminds me of how dogmatically critical of Israel Mr. Shalom and his fellow “Third Camp” radicals tend to be. New Politics, Shalom’s frequent print and online venue, is a journal explicitly identified with the Third Camp — an independent brand of socialism proclaiming a democratic-left vision that is equally opposed to capitalism and to authoritarian (e.g., Stalinist) regimes on the left. Regarding Israel and Palestine, it opposes the “intransigence of the Israeli state” but claims to defend “the rights of both Palestinians and Israelis to self-determination and security” — not the worst possible statement of principle, especially given Israel’s current hard-right governing coalition. But having closely followed Israel’s struggles and whipsawing changes for decades, I see Shalom and his ilk as overly harsh and one-sided. Shalom tries very hard to make Israel the culprit against Egypt in 1967. For example, in quoting Menachem Begin’s assertion in 1982 — when he admitted to plunging Israel into a “war of choice” in Lebanon — that the ’67 war (remembered by Israelis as an absolutely essential victory) was also one of choice, Shalom takes at face value the words of a politician justifying his contemporary actions, not someone reflecting soberly on the past. Egypt’s President Nasser fell into an abyss of his own making. Since Israel had to mobilize its reserves in response to the Egyptian build-up in the Sinai, it could not forever sustain its mobilization; Israel’s economy was paralyzed and its military state of readiness would have eroded if left in limbo indefinitely. Without any move by Egypt or the international community to defuse the crisis, Israel had to act sooner rather than later. Still, Shalom argues that “a lengthy mobilization did not spell disaster for Israel because U.S. officials made clear that they would compensate Israel for the costs of mobilization.” Given that the US was mired in the increasingly expensive morass of Vietnam, this is a dubious speculation. And this says nothing about the erosion of Israel’s capability to defend itself, as army morale waned from the prolonged tense wait. Even Shalom admits that it would have done nothing to lift the blockade; so he contends that Eilat wasn’t significant as a port anyway, denigrating the importance of Iranian oil entering Israel via the Red Sea. Moreover, there’s no sense of the political cost to Israel’s Labor-led government if it were seen by the public as backing down in the face of an enemy threat. When still a mainstream historian and not the right-leaning politician he’s become, Michael Oren uncovered evidence of a tentative Egyptian plan to attack Israel late in May, aborted on the mistaken (Soviet) assumption that the Egyptians were strong enough to absorb a first blow. Regardless, moving a large army into the Sinai, with hundreds of tanks and artillery pieces, was a violation of the 1957 armistice agreement, and had to be considered a threat, especially combined with other hostile Egyptian actions: i.e., removing the UN buffer force, blockading the Gulf of Aqaba, adding Jordan and Iraq to the Egyptian-Syrian alliance against Israel — all to the drumbeat of Nasser’s bellicose rhetoric. Yes, Israel could have accepted UN troops on its side of the border, as Shalom observes, but this would have constrained Israel’s options for maneuver against Nasser’s forces massed along the border. The whole idea of Israel is that Jews could finally act to defend themselves. I think there’s no question after Jordan had joined the fight and Syria continued to shell communities in the Galilee, that Israel had aggressive designs against them. But we know that Jordanian shelling caused considerable damage in Jerusalem; remember the Chagall windows? And kibbutzniks of a certain age readily remember huddling for hours in bomb shelters below the Golan Heights (even before the Six Day War began). Shalom is correct that Israelis (once they knew that the main threat from Egypt was over) wanted to “settle accounts” with Syria and had territorial ambitions in East Jerusalem, where they were forced to abandon Jewish neighborhoods less than 20 years before. And if you’ve being fired upon in the first place, it takes superhuman restraint not to press your advantage. That the whole West Bank easily fell into Israel’s hands was probably unanticipated, because they didn’t expect the Jordanians (who had held them off in every battle in 1948) to fold so quickly and completely. Like New Politics writers in general, Shalom’s expectations are utopian — way too pristine for this flawed planet. He has an ideological agenda that blinds him to the circumstances that Israel faced when it was still a tiny country of 2.5 million confronting a solid wall of opposition from its neighbors. That wall of opposition from the Arab world has been breached in several places in the ensuing decades, but both Israel and its regional neighbors should have done better in forging a complete and lasting peace. Israel’s overwhelming triumph in 1967 made it overconfident and over reliant on the use of military force; and it began 51 years of occupation over more than three million Palestinians — but this didn’t make its military victory invalid or unnecessary.